I love this photo, because it shows that Mars is a lively place with wind and water. These dunes near the north pole, occupying a region the size of Texas, have been sculpted by wind into long lines with crests 500 meters apart. Their hollows are covered with frost, which appears bluish-white in this infrared photograph. The big white spot near the bottom is a hill 100 meters high. • THEMIS, North polar sand sea. If you download the full-sized version of this photo, either by clicking on my picture or going to this webpage, you’ll see it’s astoundingly detailed! THEMIS is the Thermal Emission Imaging System aboard the Mars Odyssey spacecraft, which has been orbiting Mars since 2002. It combines a 5-wavelength visual imaging system with a 9-wavelength infrared imaging system. It’s been taking great pictures—especially of regions that are too rugged for rovers like Opportunity, Spirit and Curiosity. Because those rovers landed in places that were chosen to be safe, the pictures they take sometimes make Mars look… well, a bit dull. It’s not! And see the dark fuzzy stuff? More on that later! Barchans are also found on Earth, and surely on many other planets across the Universe. They’re one of several basic dune patterns—an inevitable consequence of the laws of nature under fairly common conditions. Sand gradually accumulates on the upwind side of a barchan. Then it falls down the other side, called the ‘slip face’. 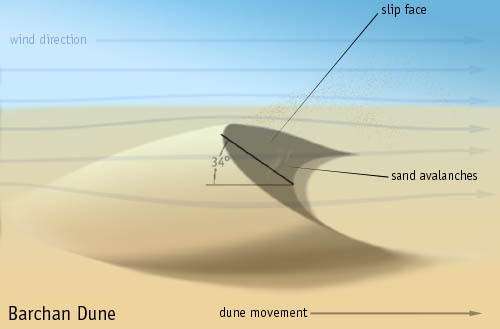 The upwind slope is gentle, while the slope of the slip face is the angle of repose for sand: the maximum angle it can tolerate before it starts slipping down. On Earth that’s between 32 and 34 degrees. 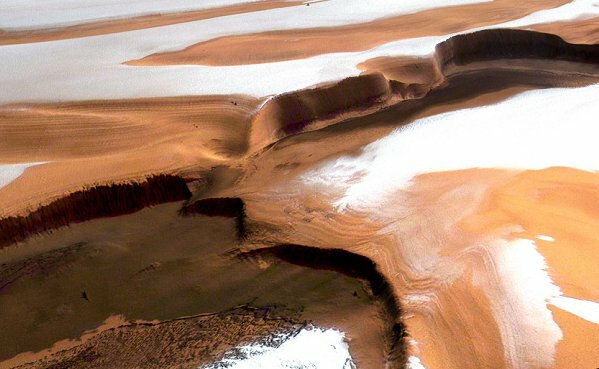 Puzzle: What is the angle of repose of sand on Mars? Does the weaker pull of gravity let sandpiles be steeper? Or are they just as steep as on Earth? 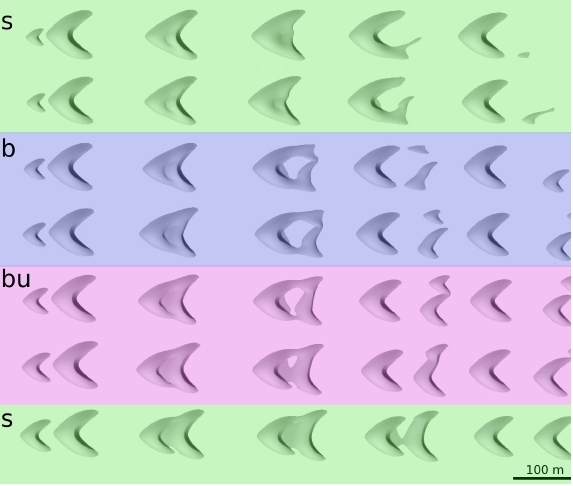 Barchans gradually migrate in the direction of the wind, with small barchans moving faster than big ones. And when barchans collide, the smaller ones pass right through the big ones! So, they’re a bit like what physicists call solitons: waves that maintain their identity like particles. However, they display more complicated behaviors. s: act like solitons, with one going right through the other! 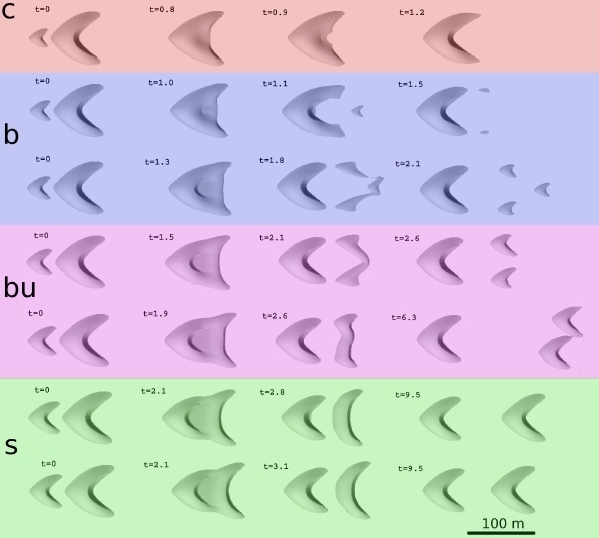 • Orencio Durán, Veit Schwámmle and Hans J. Herrmann, Simulations of binary collisions of barchan dunes: the collision dynamics and its influence on the dune size distribution. • NASA, Mars exploration program: dust storms. This picture shows a dune field less than 400 kilometers from the north pole, bordered on both sides by flat regions—but also a big cliff at one end. 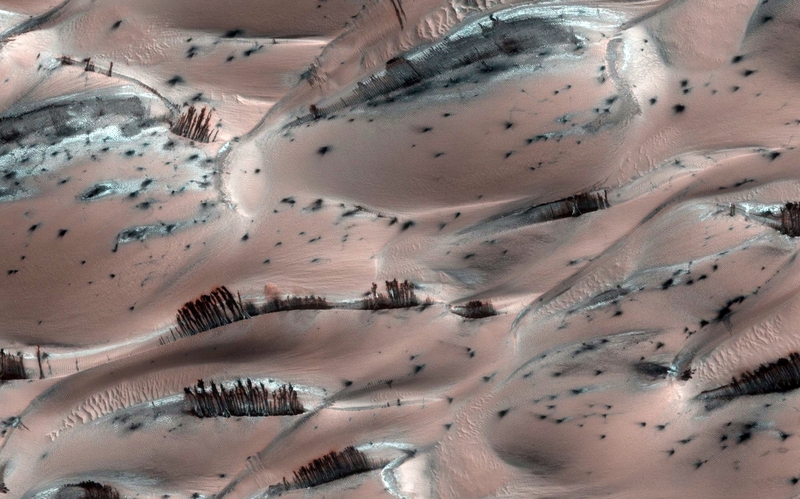 Here’s a closeup of those dunes… with stands of trees on top?!? They were first seen in 1998; they don’t look like anything we have here on Earth. To this day, no one is sure what they are, but we now know this: They come, then they go. Every Martian spring, they appear out of nowhere, showing up—70 percent of the time—where they were the year before. They pop up suddenly, sometimes overnight. When winter comes, they vanish. More recently, though, scientists have suggested that geysers are involved in this process, which might make it very active indeed! Geysers formed as frozen carbon dioxide turns to gas, shooting out clumps of dark, basaltic sand, which slide down the dunes… that’s the most popular explanation. But maybe they’re colonies of photosynthetic Martian microorganisms soaking up the sunlight! 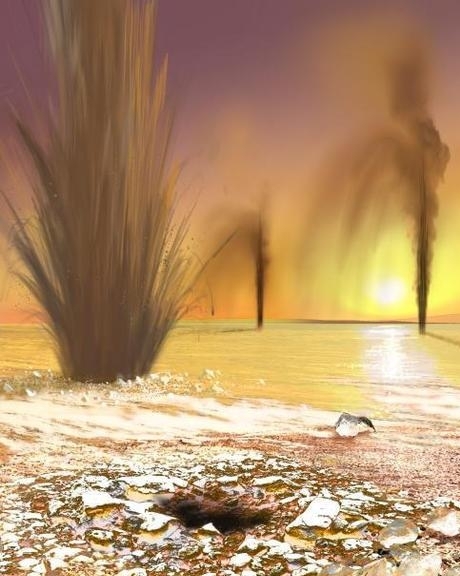 Or maybe geysers are shooting up dark stuff that’s organic matter formed by some biological process. A bunch form right around sunrise, so something is being rapidly triggered by the sun. • Robert Krulwich, Are those spidery black things on Mars dangerous? (maybe), Krulwich Wonders, National Public Radio, 3 October 2012. 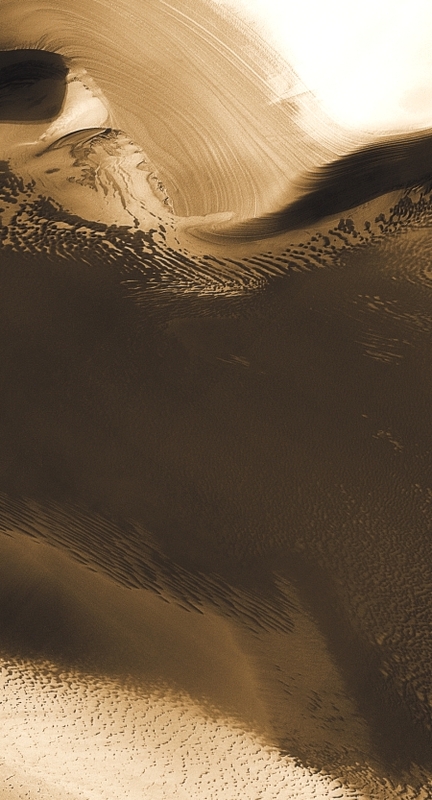 • HiRiSE, Falling material kicks up cloud of dust on dunes. What’s going on in this region of Mars? • HiRISE, Cryptic terrain on Mars. Many scientists believe this huge plain was an ocean during the Hesperian Epoch, a period of Martian history that stretches from about 3.5 to about 1.8 billion years ago. Later, around the end of the Hesperian, they think about 30% of the water on Mars evaporated and left the atmosphere, drifting off into outer space… part of the danger of life on a planet without much gravity. The oceans then froze. Most of them slowly sublimated, disappearing into water vapor without ever melting. This water vapor was also lost to outer space. 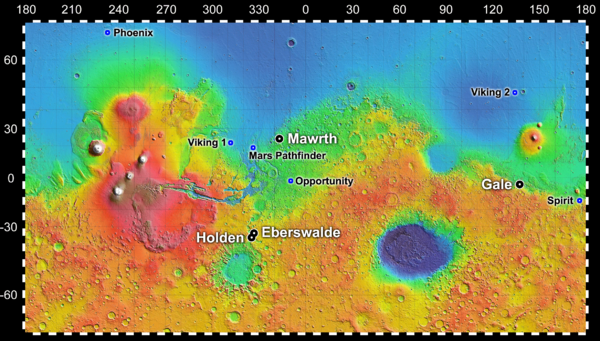 • Linda M. V. Martel, Ancient floodwaters and seas on Mars. But there’s still a lot of water left, especially in the polar ice caps. The north pole has an ice cap with 820,000 cubic kilometers of ice! That’s equal to 30% of the Earth’s Greenland ice sheet—enough to cover the whole surface of Mars to a depth of 5.6 meters if it melted, if we pretend Mars is flat. And the south pole is covered by a slab of ice about 3 kilometers thick, a mixture of 85% carbon dioxide ice and 15% water ice, surrounded by steep slopes made almost entirely of water ice. This has enough water that if it melted it would cover the whole surface to a depth of 11 meters! 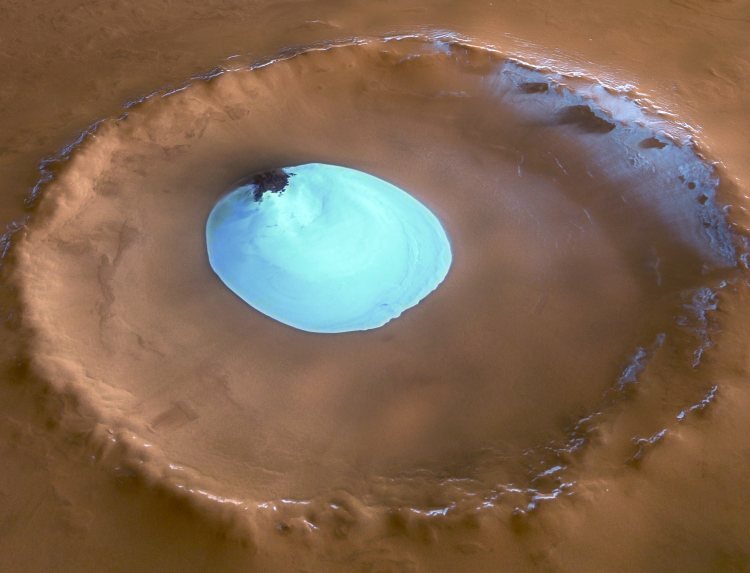 • ESA, Water ice in crater at Martian north pole. The image is close to natural color, but the vertical relief is exaggerated by a factor of 3. The crater is 35 kilometers wide and 2 kilometers deep. It’s incredible how they can get this kind of picture from satellite photos and lots of clever image processing. I hope they didn’t do too much stuff just to make it look pretty. As in Antarctica and Greenland, cold dense air flows downwards off the polar ice cap, creating intense winds called katabatic winds. These pick up and redeposit surface ice to make grooves in the ice. The swirly pattern comes from the Coriolis effect: while the winds are blowing more or less straight, Mars is turning around its pole, so they seem to swerve. 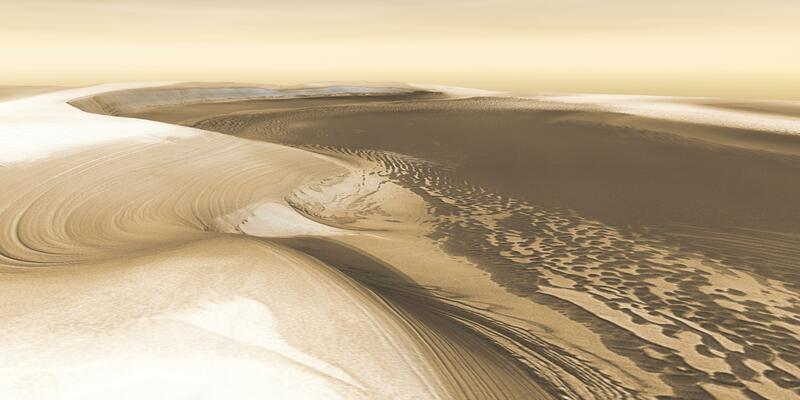 Climatic cycles of ice and dust built the Martian polar caps, season by season, year by year—and then whittled down their size when the climate changed. Here we are looking at the head of Chasma Boreale, a canyon that reaches 570 kilometers (350 miles) into the north polar cap. Canyon walls rise about 1,400 meters (4,600 feet) above the floor. Where the edge of the ice cap has retreated, sheets of sand are emerging that accumulated during earlier ice-free climatic cycles. Winds blowing off the ice have pushed loose sand into dunes, then driven them down-canyon in a westward direction, toward our viewpoint. • THEMIS, Chasma Boreale and the north polar ice cap. 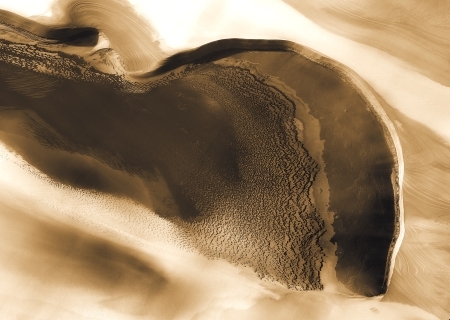 • THEMIS, Dunes and ice in Chasma Boreale. Scientists are studying these layers in the ice cap to see if they match computer simulations of the climate of Mars. Just as the Earth’s orbit goes through changes called Milankovitch cycles, so does the orbit of Mars. These affect the climate: for example, when the tilt is big the tropics become colder, and polar ice migrates toward the equator. I don’t know much about this, despite my interest in Milankovitch cycles. What’s a good place to start learning more? As we’ve seen, Mars is a beautiful world, but a world in a minor key, a world whose glory days—the Hesperian Epoch—are long gone, whose once grand oceans are now reduced to windy canyons, icy dunes, and the massive ice caps of the poles. Let’s say goodbye to it for now… leaving off with this Martian sunset, photographed by the rover Spirit in Gusev Crater on May 19th, 2005. • NASA Mars Exploration Rover Mission, A moment frozen in time. This Panoramic Camera (Pancam) mosaic was taken around 6:07 in the evening of the rover’s 489th martian day, or sol. Spirit was commanded to stay awake briefly after sending that sol’s data to the Mars Odyssey orbiter just before sunset. This small panorama of the western sky was obtained using Pancam’s 750-nanometer, 530-nanometer and 430-nanometer color filters. This filter combination allows false color images to be generated that are similar to what a human would see, but with the colors slightly exaggerated. In this image, the bluish glow in the sky above the Sun would be visible to us if we were there, but an artifact of the Pancam’s infrared imaging capabilities is that with this filter combination the redness of the sky farther from the sunset is exaggerated compared to the daytime colors of the martian sky. Because Mars is farther from the Sun than the Earth is, the Sun appears only about two-thirds the size that it appears in a sunset seen from the Earth. The terrain in the foreground is the rock outcrop “Jibsheet”, a feature that Spirit has been investigating for several weeks (rover tracks are dimly visible leading up to Jibsheet). The floor of Gusev crater is visible in the distance, and the Sun is setting behind the wall of Gusev some 80 km (50 miles) in the distance. This mosaic is yet another example from MER of a beautiful, sublime martian scene that also captures some important scientific information. Specifically, sunset and twilight images are occasionally acquired by the science team to determine how high into the atmosphere the martian dust extends, and to look for dust or ice clouds. Other images have shown that the twilight glow remains visible, but increasingly fainter, for up to two hours before sunrise or after sunset. 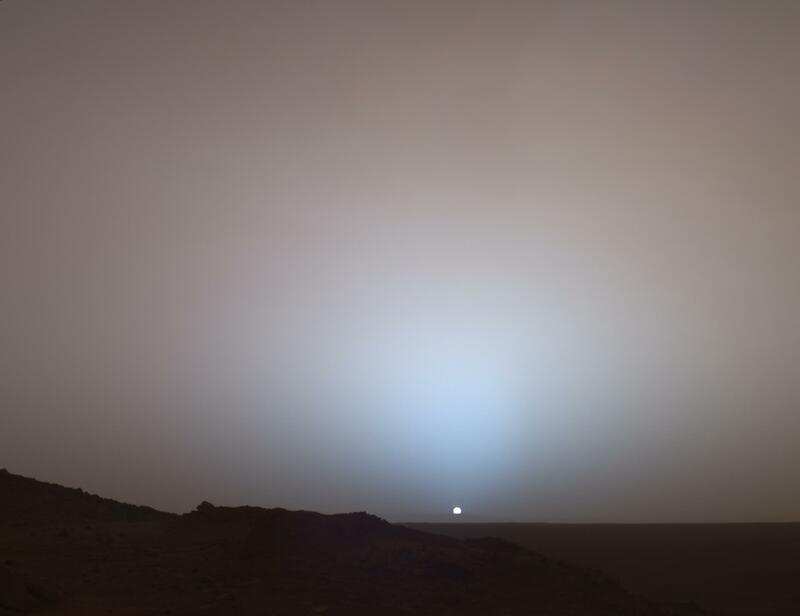 The long martian twilight (compared to Earth’s) is caused by sunlight scattered around to the night side of the planet by abundant high altitude dust. Similar long twilights or extra-colorful sunrises and sunsets sometimes occur on Earth when tiny dust grains that are erupted from powerful volcanoes scatter light high in the atmosphere. This entry was posted on Sunday, November 11th, 2012 at 6:46 pm and is filed under astronomy, climate. You can follow any responses to this entry through the RSS 2.0 feed. You can leave a response, or trackback from your own site. John: If interested in how this climate might affect possible life subsurface there, read my THE MARTIAN RACE that explores these elements. Hi! Is that a novel or short story? New or old? A novel from 1999. I worked with Jim Cameron on a movie of it but that fell through, as usual for Hollywood. I said this already on your Google+ account (even if what I said seemed to have disappeared) that I find that this doesn’t look like some things are falling nor does it look like geysers. It doesn’t look like somethings falling because it doesn’t look as if these black objects are following the landscape as falling objects do. It doesn’t look like a geyser just by the shape. I had just now really seen the upper part, there it looks definitely even less like some things falling or geysers, but more like some branches/trees kind of things. Where did you get that long image from? I couldn’t find it on the HiRiSE page. aren’t there more images from this particular scene? It seems they didn’t have a radar in order to assess the curvature of the surface, but if there would be more images then people there at HiRiSE could at least try camera tracking! Your comment is still on Google+. You wrote it in a different place than you were looking for it! It doesn’t look like a geyser just by the shape. I don’t think people are claiming the geysers are visible! I think they’re claiming the material spewed out by geysers falls on the ground, and that material is visible. However, I’m still hoping that the true explanation of this phenomenon is more exciting than the geyser theory. Where did you get that long image from? I couldn’t find it on the HiRiSE page. Aren’t there more images from this particular scene? However, you need to go near the bottom and pick ‘JPEG’. You’ll get a huge image, and if you blow that up you can see many interesting scenes. yes. you are right. I didn’t notice/forgot that you posted the image twice. Yes these traces look a bit like avalanche deposits. Moreover it looks as if the material is cloaking in between, it looks different then usual falling down objects, this may be due to a solidification of the underlying soil, but i find this cloaking looks rather as if there is at least some kind of freeze/crystallizing process going on, a bit similar to solidifying lava, but different. This is really hard to see and as said a camera tracking could give much better information on the form of the “falling objects” vs. the terrains shape. And what material is the soil here? Could there at all be some kind of smouldering going on? How much are the barchans moving? Is it at all possible that the temperature differences between inside a barchan and outside could make up for a phase change or any kind of chemical (gaseous) process? Another important information missing here is how the winds are changing, because if these things do not just crack down from the riff of a barchan (like a breaking wave) but are “spewn out” then depending on pressure and (local) wind changes “objects” might also “fall down” the other sice of a dune. Given the rather big color difference this should be visible at least for a while. I clicked on the links under “wallpaper” and there you get only the detail in different resolutions. So I didn’t assume that the other images in that HIView section were different, but thought that these were customized for this (outdated) HIView viewer, which I didn’t feel like downloading or activating. But now I downloaded the long image and looked at it closer. The information at the bottom of the page says the image has a scale of 25cm/pixel. Counting pixels these things are mostly 20 to almost 50 pixels long! That is these things are 5 to over 8 m long! Somewhere it was written that these things disappear and show up at different places. So it seems there should exist more images. ?? I find it hasn’t been fully ruled out that the things could also be some kind of branched, algae-kind of organism, looking for the sunniest, at least temporarily rather sand free kept place (that is at the tip it seems at least not immediately covered with sand, like eventually in a valley or in the plains ?? But I don’t know much about how fast such a sand covering is taking place and how fast the riff of a barchan changes) How is the suns position here? I am actually quite shocked that these things seem to have yet not been investigated more thoroughly! ? Or maybe the big discussion about them is somewhere hidden in the internet? How far is this place away from curiosity? Do you know? Given the images of the water on Mars you had today on Google plus these things appear even less likely to be water streams. John, your comment contains only the words “The images:” and the gif animation you had posted on Google Plus. Was your text covered by the animation? Yes I meant these water streams. They look very different from those images. With some phantasy one could at most take shockfreezed streams of “ironkind water” as a possible hypothesis into consideration for the southpole images. But as said I have problems to see how those “southpole streams” are streams or even avalanches, since they do not seem to follow much the landscape, even if I hold the image upside down. On the other hand they still could be avalanche deposits, it’s really hard to tell. Do you know if there are other images of that region? In the winter, a layer of carbon dioxide ice covers the dunes, and in the spring as the sun warms the ice it evaporates. This sounds as if they have some time resolved images. The location (83,118) is not in the range of the browser. The location (118,83) looks very blurry. John, your comment contains only the words “The images:” and the gif animation you had posted on Google Plus. Right. I was showing people here the images. • Seasonal flows on warm Martian slopes, Wikipedia. these have been seen at latitudes from 48°S to 32°S. The south pole has an ice cap made mostly of carbon dioxide. There are more pictures on this Wikipedia page. I don’t know any “southpole streams”. There are no images of the South Pole on this blog page. I am sorry I meant north pole as a kind of abbreviation for the “high latitudes” (83,118) image (which you showed <https://johncarlosbaez.wordpress.com/2012/11/11/wind-and-water-on-mars/#comment-21895“>here) which were mentioned in the text. I assumed that latitudes and longitudes are measured on Mars in a way that north pole is (90,*), but then it seems that in the browser north is not up, as usual. I didn’t notice/forgot that you posted the image twice. I’m not sure what you mean by ‘cloaking’ means here. The only place I’ve heard that verb is on Star Trek, where the Romulan space ships ‘cloak’, meaning ‘become invisible, as if hidden by a cloak’. And what material is the soil here? The surface soil is sand of some sort, but I don’t know its chemical composition. 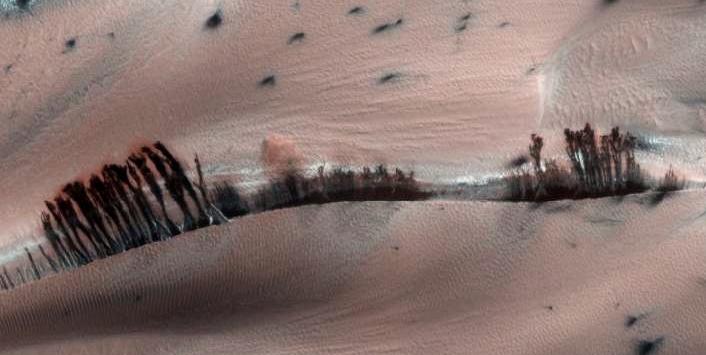 The geysers’ two most prominent features (dark dune spots and spider channels) appear at the beginning of the Martian spring on dune fields covered with carbon dioxide (CO2 or ‘dry ice’), mainly at the ridges and slopes of the dunes; by the beginning of winter, they disappear. Dark spots’ shape is generally round, on the slopes it is usually elongated, sometimes with streams -possibly of water- that accumulate in pools at the bottom of the dunes. Dark dune spots are typically 15 to 46 metres (50 to 150 feet) wide and spaced several hundred feet apart. The size of spots varies, and some are as small as 20 m across, —however, the smaller size seen is limited by imaging resolution— and can grow and coalesce into formations several kilometres wide. Spider features, when viewed individually, form a round lobed structure reminiscent of a spider web radiating outward in lobes from a central point. Its radial patterns represent shallow channels or ducts in the ice formed by the flow of the sublimation gas toward the vents. The entire spider channel network is typically 160–300 m across, although there are large variations. Each geyser’s characteristic form appears to depend on a combination of such factors as local fluid or gas composition and pressure, ice thickness, underlying gravel type, local climate and meteorological conditions. The geysers’ boundary does not seem to correlate with any other properties of the surface such as elevation, geological structure, slope, chemical composition or thermal properties. The geyser-like system produce low albedo (reflectivity) spots, fans and blotches, with small radial spider-like channel networks most often associated with their location. At first, the spots seem to be grey, but later their centres darken because they gradually get covered with dark ejecta, thought to be mainly basaltic sand. It should be noted that not all dark spots observed in early spring are associated with spider landforms, however, a preponderance of dark spots and streaks on the cryptic terrain are associated with the appearance of spiders later in the season. Time-lapsed imagery performed by NASA confirms the apparent ejection of dark material following the radial growth of spider channels in the ice. Time-lapsed imaging of a single area of interest also shows that small dark spots generally indicate the position of spider features not yet visible; it also shows that spots expand significantly, including dark fans emanating from some of the spots, which increase in prominence and develop clear directionality indicative of wind action. Some branching ravines modify, some destroy and others create crust in a dynamic near-surface process that extensively reworks the terrain creating and destroying surface layers. Thus, Mars seems to have a dynamic process of recycling of its near surface crust of carbon dioxide. Growth process is rapid, happening in the space of a few days, weeks or months, a growth rate rather unusual in geology – especially for Mars. 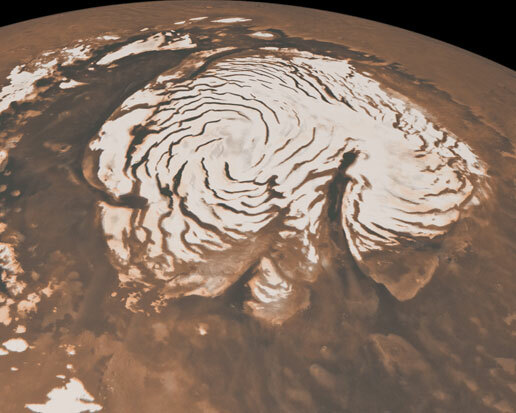 A number of geophysical models have been investigated to explain the various colors and shapes’ development of these geysers on the southern polar ice cap of Mars. How far is this place away from Curiosity? Do you know? The ‘geysers’ and ‘spiders’ are near the south pole, in an area called the cryptic region, at latitudes 60° to 80° south and longitudes 150°W to 310°W. This was a language mistake. I was thinking of cloak and assumed that making the noun into a verb could mean “make something into a cloak”. Usually I check back if I do this, but obviously not this time. I meant that the “tentacles” or whatever you want to call these “things” are sometimes sort of slubbing in a fabric kind of sense, so if these would be falling objects/liquids then there must be something like an underlying solid soil formation in order to give some kind of explanation for this phenomenom. On the other hand these kind of “roots”, as can be seen in the valleys, which are probably the “polygonal cracks” (??) as described on the Nasa site could be some cloaked structure (although I find these look more as being of geological origin, but who knows!). The spiders look to me also more like some lichen, rather than a geyser, see e.g. : Kananakislichen (remark: when I was talking about the algae, then I had actually rather some kind of lichen (en.wikipedia.org/wiki/Algae#Symbiotic_algae or some other kind of fungus like http://www.amanita.fotovidi.nl/popup.php?pID=1913,http://www.amanita.fotovidi.nl/popup.php?pID=1876 in mind, since there doesnt seem to be much liquid in this Mars landscape.) By the way the sizes in the above description differ about by a factor of 4 from the information on the Nasa page. ?? I actually looked wether I could find more images about the “tentacle things” (not the spiders) , eventually one could do a camera tracking in blender, but I couldnt find other images then the one mentioned above. I couldnt find any Hirise student there ??? ho non trovato uno studente Hirise ??? Here is – what appears to be – a close-up of some of the features in the cryptic terrain (?). Looks quite strange. Unfortunately the image is a header to the science theme page with no further description and I haven’t sofar found this particular image among the seasonal images which carry latitude and longitude labels etc. I meanwhile looked through all seasonal process images (where this looked especially like something sci-fi fans might find nicely suspicious). a high res image which seems to display exactly this section of Mars, but it seems to be not exactly the same image. So the image is not from cryptic terrain, but from Russel crater -still on the southern hemissphere but a little more higher north. The black things trees/geysers/avalanches/lichens look strange. In this high res version at Russel crater though the long ones look indeed like some matter falling down….or some long dangling lichens…However they at least follow the shape of the underlying barchan. Looking at the black stuff and other barchans in more detail here quickly some of the most interesting images and features. The black things seem to avalanche down (if they do) on the steep sides of the slip face or rather as in this northern dunes on the slip face itself. Since there are sand avalanches on the slip face that could explain why the black lines are so straight – i.e. there is no curved terrain there. On the wind side the material seems to be spread by the wind. In this image though some of them look indeed like spewing geysers. Interestingly they prefer or may accumulate cold regions with white snow around them (see also here or here), which could make sense in the context of some sublimation process. 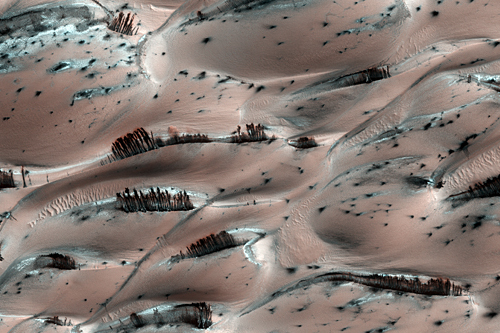 And I don’t know why this image got the name dune erosion, but here you see again that some of the long black things do not seem to follow the terrain (Look e.g. utmost top part at the red border line on the right) but rather stand strangely (inclinated) up, either as if something is spewn out (“geyser”) (but one sees no curvature due to gravitation) or as if this is some tree/fungus/lichen whatever. The spewn out material (if it is spewn out) looks sometimes strangely thicker on the ends (thats what I called falsely called “cloaking”, having a cloak and clogging and clotting in mind), but if this is from rolling down then this could be due to accumulating material at the end of the slope. By the way there was an interesting article about only recently detected features of earthly lichens. Yes, the fact that macrolichens contain basidiomycete yeasts as well as ascomycete fungi and algae is really cool! I’m still astounded at the ability to view same-day, high-res images from Curiosity on my smartphone. The technology to make this possible is mind-boggling. 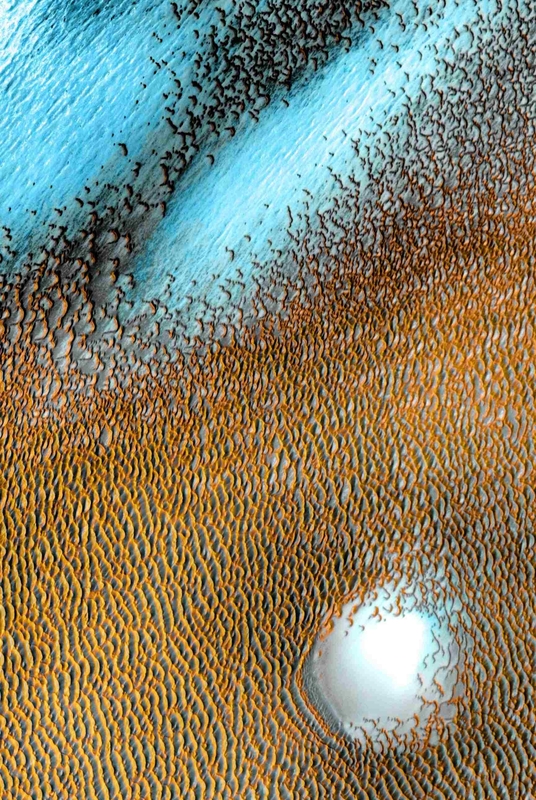 But these amazing, colorful, captivating images of Mars just take my breath away. And the thinking that is going into their interpretation is of the highest quality and is extremely enlightening. Thank you, John, for pulling all this information together and presenting it in your own inimitable way! Very nice photos, but the place doesn’t look particularly inviting to human life. Curiosity needs to stop chewing rocks and get on with terraforming! This looks like a translation of my post into Russian.